FIFA Opening Ceremony At "The Arena de Sao Paulo"
Finally the day is arriving when Brazil FIFA World Cup 2014 will get under way, 12th June 2014 is a day for which the world’s football fans had been waiting expectantly since the last FIFA Football World Cup in 2010. 32 nations teams are heading to Brazil to participate in FIFA Football World Cup 2014. Meanwhile 12 hosting cities in Brazil are busy giving finishing touches to the preparations, more than 600 dancers are rehearsing day and night to stage a show that will delight and captivate the watching world, at the tournament’s 2014 FIFA Football World Cup Opening Ceremony. As a symbol of peace, Brazil and FIFA will dedicate a special moment prior to the kick-off of the opening match. Following the pre-match protocol and the coin toss, players and officials will meet around the centre circle, with one team on each side. Three children, each carrying a dove, will come on to the pitch and move to the middle of the centre circle, where they will release the three doves into the sky. The symbol of peace will mark the official opening of the 2014 FIFA World Cup. The Local Organizing Committee for the FIFA World Cup, President Eugenio Figueredo, convened on Thursday in Sao Paulo for its last meeting before the tournament satrts. The executives received comprehensive reports on the preparations and expressed their eagerness for the 20th edition of the FIFA World Cup to begin, with just seven days to go before the opening match between hosts Brazil and Croatia at the Arena de São Paulo on 12 June. The meeting was also attended by Brazil’s Sports Minister Aldo Rebelo. 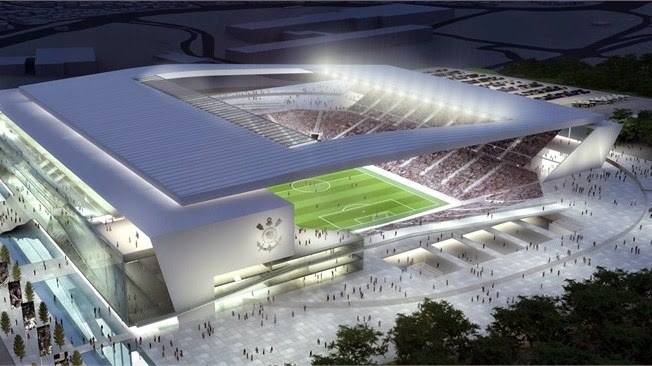 The “New Corinthians Stadium” or "Arena de Sao Paulo " will host the opening ceremony of FIFA World Cup. This time is going to be one of the biggest curtain raiser in the recent history. The Timings for this historic tournament is going to Kick off at 3:15 pm local time, The FIFA Football World Cup ceremony will showcase the diversity and beauty of Brazil with a message of peace. The 25-minute performance will come alive around a glowing spherical centerpiece symbolizing a soccer ball. Made of 90,000 light clusters, the ball will have a total luminance of 7,000 Lux. After the dancers and performers, who will showcase the treasure of Brazil through their breathtaking performances, Pitbull, Jennifer Lopez, Claudia Leitte and the drumming collective Olodum will take the center stage and perform on “Ole Ola (We Are One)”, the official song of FIFA 2014 World Cup Football Brazil. All these live performances would run for approx 2 hours, which is more than the time 2010 FIFA Football World Cup opening ceremony took. Astonishing fireworks would mark the conclusion of the opening ceremony.